This Twice Cooked Pork, along with Mapo Dofu (麻婆豆腐) and Kung Pao chicken (官保雞丁) is one of my favourite Sichuan-style Chinese dishes. The English name of this dish is well translated from its original Chinese name (回鍋肉 Hui Guo Rou ), that literally means "meat that has been returned to the pot". 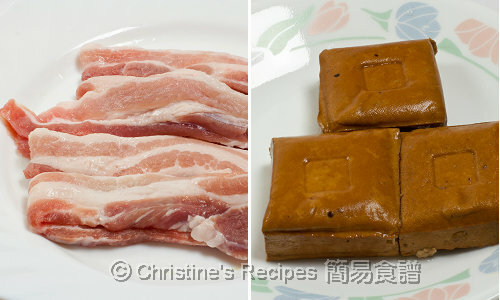 Traditionally, a big chunk of pork belly is used. Blanch it in boiling water with slices of ginger and spring onion first, followed by being thinly sliced when it cools down in cold water completely. The pork has to be returned to pot/wok, shallow fried in hot oil until brown, then stir fry with other ingredients. This dish looks easy to cook, but the preparation of the pork belly slices is somehow troublesome for a home cook. If you have a knife as sharp as a ceramic one, that won’t be any problem at all. When comes to cooking, sometimes I love short cuts. Here’s my cheat's version of this dish. The only thing I have to do is to get the pre-sliced pork belly, that's for BBQ, from a Korean butcher shop, then cut them into short sections. Simply pop them in a frying pan to brown them. Still, I can call this dish as Twice Cooked Pork, as the pork has to be returned to the pan again, finished cooking with other ingredients. Cut pork slices into 4 to 5cm long. Season with salt and pepper. Discard oil from pan, retain about 1 to 2 tablespoons of oil, just enough to stir fry. Add sweet bean sauce and chilli bean sauce and saute until aromatic. Add capsicum and dried spicy tofu. Pour in chicken stock. Continue to cook until capsicum is just cooked, yet still crisp. Toss back the pork slices. Increase heat to high. Sprinkle wine. Quickly stir to combine. Season with sugar or salt if needed. Remember to taste by yourself. When sauce dries up, add spring onion. Dish up. Serve immediately. Sometimes I like to add Chinese cabbage or Taiwanese cabbage to increase more texture. 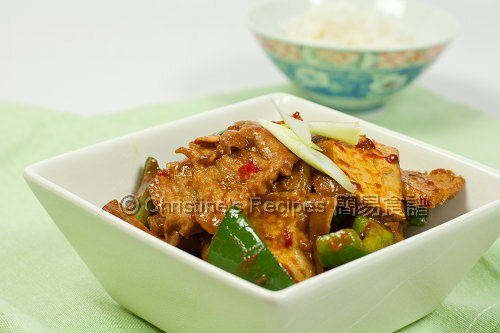 The vegetable will absorb all the flavours of pork and bean sauce. Taste wonderful. Traditionally, this dish will not add dried spicy tofu. This is my personal favoritism to this special Chinese ingredient. If you haven’t tried it before, it’s worth trying its special texture and taste. That’s really good for Chinese stir fry. The dried spicy tofu is available at any Asian grocery stores, normally placed in fridge. If you can’t find any pork belly slices, you might like to ask the butcher to help thinly slice for you. this looks appetising..not quite sure about the sweet bean sauce..not sure if it's available at my place..it's not the same as tou cheong, right? Sometimes I even use leftover meat : ). Your named dishes are also among my favorite Sichuan dishes. My fav Szechuan dish is Mapo Tofu. I like the addition of spicy tofu in this dish for more substance. I hardly cook pork at home now, so tofu is good! Oh wow this looks so delicious! I love pork and this is just so comforting with white rice. Looks so yummy and appropriate for this cold weather! I love twice-cooked pork. Love your version! Delicious. That's not a cheat version but brilliant creation!! If I were to cook this dish, I will definitely use your method. It makes life easier! Thanks for sharing! Love your wui wo yuk...I love that kind of spicy tofu too hehe..a totally mouthwatering dish! There are a lot of variations of twice cooked pork. Take this one as an example. It's also very tasty. 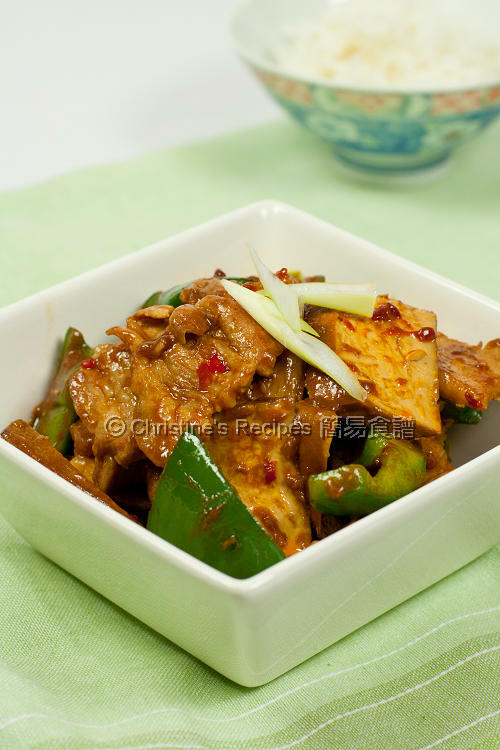 Generally speaking, it's great to fry twice cooked pork with bean curd, or peppers or leek and so on. I cannot find sweet bean sauce, what can I use instead? May i know what is the Chinese name for Sweet Bean Sauce?